I became Vicar of Milton in September, 2010; and was appointed as Priest-in-Charge of Norton in October 2018 - thus becoming the parish priest for both parishes. I was asked by the Bishop to become Rural Dean for Leek Deanery in October 2015. Before I came to Stoke on Trent, I was a vicar in Stockport, near Manchester, just within the borders of Chester Diocese. Born in Birkenhead, Wirral, in 1955. I went from school to study theology at King's College London and St Stephen's House in Oxford, and was ordained in Chester Cathedral in 1978. I have spent the largest proportion of my ministry within Chester Diocese, but have also tested a vocation to the religious life as a friar within the Society of St Francis. 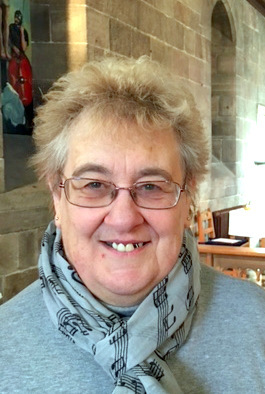 I am spiritual director to a number of people - clergy and lay - and have been Diocesan Spiritual Director for the Cursillo movement in Chester Diocese. My keen interest is to see people grow in their spiritual lives. For leisure I enjoy crime novels, theatre, ballet, art galleries (I especially love the Pre-Raphaelites artists), and travel. Hi, I am Jill - widowed with two grown up sons and one grandaughter. I began to regularly attend Milton Church years ago. when my father was ill. I found the folk at Milton very friendly and welcoming and I quickly settled in. My spiritual journey led me to offer myself for ordination, and was accepted. Since my ordination in June 2017, I have been the curate of Milton and Norton Parishes. I was born and grew up in the parish and worked as a Nursery and Infant teacher until I was accepted for training for ordination. I was ordained in the year 2000. I am married to Ray, and we have two married children, and three grandchildren. I retired from full time parish ministry in 2012, and moved back to Milton - where I am privileged to serve alongside Fr Brian. I have been a Reader at Milton Church since 1978. I am married to Liz and we have two grown-up sons. Celtic Christian spirituality excites me, and I am a member of the Community of Aidan and Hilda. Other interests include practical countryside conservation (Liz and I volunteer with Staffordshire Wildlife Trust) and country walking. I am privileged to help with the ministries of preaching, teaching and pastoral visiting at Milton, and feel blessed by sharing Christian witness with so many friends in this church. I have been a member of Milton Church since I became a Christian when I was 31. I am married to Rob, and we have 4 children, 8 grandchildren and 2 great grandchildren. I have been nursing for over 40 years and currently work as a GP Practice Nurse. In September 2015 I began my first year of Ordination Training to become an Ordained Local Minister. Hi, I'm Liz Wright. I've been coming to Milton Church since I was a small girl. I met and married my husband here and our daughters have attended the church since they were born. I have been a part of the Messy Church Planning team since we started around 4 years ago. Our desire is to encourage new families to join our larger Church family. We have lots of fun at our Messy Church on the third Saturday of each month, and would love everyone to come and join us, and learn about the good news of Jesus. I have been a member of St Philip and St James' Church for 17 years (although I was christened here back in 1963!) and have been a member of the PCC for 10 years. My working background is Accountancy, (which is useful when dealing with something as important as the church's finances). I am married to Kevin, and we have two growing sons who have been a part of the Junior/Young Peoples' Church Fellowship in the church since the day they were born, and are now taking on more adult roles. Milton has always been a special church for our family and we all enjoy both its spiritual and social aspects. We've been editing the Parish Magazine for four years and like to make sure we put in as much as we can about the Parish. If you've got any news or information which you think others would like to know about just let us know and we can get it out to the Parish. As well as editing the Parish Magazine, Michael is the Sacristan (preparing the church for services) and PCC Secretary.